Fencing & Security The latest product news Page 12 Technical Article Preparing the ground for 3G Page 19 Compact Tractors The industry's valuable work horses Page 20-21 Product News EMAIL: news@landscapeandamenity.com 03 03 L a n d s c a p e & A m e n i t y w w w . l a n d s c a p e a n d a m e n i t y. c o m August 2018 Special Feature Play & Activity supplement To mark the launch of #LoveParks Week last month Keep Britain Tidy called on parents across the UK to make time to visit their local green space with their child, as research shows a whopping 75% of children would like to spend more time outdoors. The research reveals that children in Britain visit outdoor spaces an average of three times a week, with four out of five parents (80%) admitting they would like their child to spend more time outside. When it comes to barriers to children spending time outdoors, the top reason given by parents was that they don't have time to take their children to the park. As a result, classic outdoor skills children often learn in the park could be on the decline, with the research indicating that over a third (34%) of children have never learnt to ride a bike, and almost half (49%) have never climbed a tree. A new £7 million fund to support trailblazing approaches to building more integrated communities in England has been launched. The Integrated Communities Innovation Fund will help drive forward the proposals to tackle the key causes of poor integration set out in the government's Integrated Adding to its range of MultiSystem tools, STIHL has unveiled the new MM 56 MultiEngine suitable for a wide range of tasks in lawn maintenance, soil cultivation and surface cleaning. Replacing the MM 55, the new MM 56 delivers more power and torque thanks to the upgraded 2-Mix engine, providing that little bit extra when needed. STIHL 2-Mix technology also offers higher efficiency and lower emissions, rendering it more economical than its predecessor. Supplied with a wheel kit as standard, the MM 56 is compatible with the extensive range of existing attachments and is suitable for a host of different applications including edging, lawn aerating and sweeping. 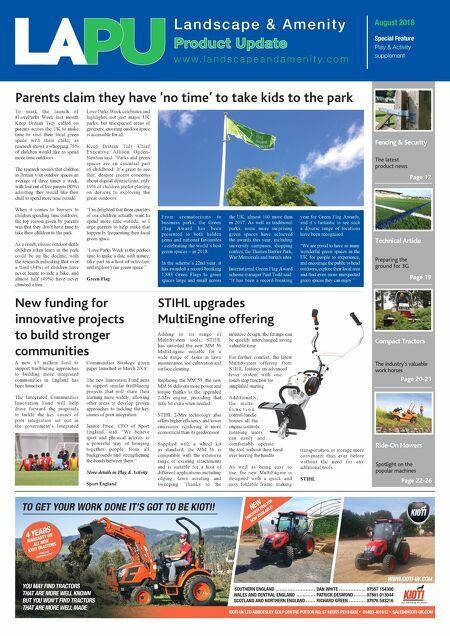 Thanks to the New funding for innovative projects to build stronger communities STIHL upgrades MultiEngine offering Love Parks Week celebrates and highlights not just major UK parks, but unexpected areas of greenery, ensuring outdoor space is accessible for all. K e e p B r i t a i n T i d y C h i e f Executive Allison Ogden- Newton said: "Parks and green spaces are an essential part of childhood. It's great to see that, despite recent concerns about digital distractions, only 19% of children prefer playing on devices to exploring the great outdoors. "I'm delighted that three quarters of our children actually want to spend more time outside, so I urge parents to help make that happen by frequenting their local green space. "Love Parks Week is the perfect time to make a date with nature, take part in a host of activities, and explore your green space." Green Flag Communities Strategy green paper launched in March 2018. The new Innovation Fund aims to support similar trailblazing projects that will share their learning more widely, allowing other areas to develop proven approaches to tackling the key causes of poor integration. Jennie Price, CEO of Sport England, said: "We believe sport and physical activity is a powerful way of bringing together people from all backgrounds and strengthening the bonds between them." More details in Play & Activity Sport England intuitive design, the fittings can be quickly interchanged saving valuable time. For further comfort, the latest MultiSystem offering from STIHL features an advanced lever system with one touch stop function for simplified starting. Additionally, the multi- f u n c t i o n control handle houses all the engine controls, meaning users can easily and comfortably operate the tool without their hand ever leaving the handle. As well as being easy to use, the new MultiEngine is designed with a quick and easy foldable frame, making Parents claim they have 'no time' to take kids to the park F r o m c r e m a t o r i u m s t o business parks, the Green F l a g A w a r d h a s b e e n presented to both hidden gems and national favourites - celebrating the world's best green spaces – in 2018. In the scheme's 22nd year, it has awarded a record-breaking 1,883 Green Flags to green spaces large and small across the UK, almost 100 more than in 2017. As well as traditional parks, some more surprising green spaces have achieved the awards this year, including university campuses, shopping centres, the Thames Barrier Park, War Memorials and burials sites. International Green Flag Award scheme manager Paul Todd said: "It has been a record-breaking year for Green Flag Awards, and it's fantastic to see such a diverse range of locations have been recognised. "We are proud to have so many wonderful green spaces in the UK for people to experience, and encourage the public to head outdoors, explore their local area and find even more unexpected green spaces they can enjoy." transportation or storage more convenient than ever before without the need for any additional tools. STIHL Ride-On Mowers Spotlight on the popular machines Page 22-26 07557 154300 07881 013044 07876 593216 DAN WHITE PATRICK DESMOND RICHARD GREEN WWW.KIOTI-UK.COM TO GET YOUR WORK DONE IT'S GOT TO BE KIOTI! YOU MAY FIND TRACTORS THAT ARE MORE WELL KNOWN BUT YOU WON'T FIND TRACTORS THAT ARE MORE WELL MADE 4 YEARS WARRANTY ON ALL NEW KIOTI TRACTORS *TERMS AND CONDITIONS APPLY SOUTHERN ENGLAND WALES AND CENTRAL ENGLAND SCOTLAND AND NORTHERN ENGLAND KIOTI UK LTD ABBOTSLEY GOLF CENTRE POTTON RD, ST NEOTS PE19 6XN • 01480-401512 • SALES@KIOTI-UK.COM NEW DK6010CH TRACTOR NOW AVAILABLE!